6 What do we recommend for the best shooting mat? Bob Allen Shooting Mat. 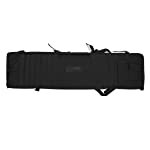 This tactical shooting mat is our most affordable item in the list. The good news about it is that it is definitely worth your money because of the innovative designs that the mat is incorporated with. It also received an above average mark in the quality scale, making it a great value for your money. Pro Series Shooting Mat. Our mid-range shooting mat is from Midway USA, a renowned manufacturer of arsenal gears and other must-haves. The item is one of the collections in the in its pro series with industry-grade design and features. It’s a promising and advanced shooting gear that serves multiple purposes, giving you so much more than you paid for. Rifle Drag Bag/Shooting Mat in One. The Voodoo Tactical shooting mat is a dual-purpose arsenal accessory that is made for combat missions and outdoor shooting activities. It is the most expensive in our top 3 brood of shooting mats so if you want to spend more on a tactical bag and mat in one, this is a good choice. The best shooting mat should be resilient, flexible, and would last for years especially in the most extreme of outdoor conditions and demands. The overall construction and materials used to make the mat play a crucial role in its ability to withstand pressure and outdoor elements and stay in tip top shape for years. Rifle Drag Bag/Shooting Mat in One. This multi-purpose shooting mat and rifle drag bag in one is a forerunner in the durability department with its top notch materials and construction. The bag is tough and could withstand weight of various items that you put to carry around for combat and other outdoor shooting activities. The durable features include the reliable rigging, heavy-duty materials and the full backpack with harness design. Bob Allen Shooting Mat. There are various features in this shooting mat that shouts of durability and long-lasting use all over. The mat is made with a non-slip and rubberized surface with coated poly materials that are undoubtedly water resistant. 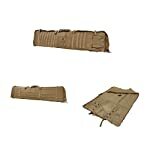 It has a poly webbing design to make sure that the mat stays in good condition regardless of the outdoor conditions and demands during combat or target shooting. Pro Series Shooting Mat. The shooting mat enjoys good ratings especially in terms of its durable and resilient design. The thick and water resistant mat packs up nice and gives you ample space to stash all your gears and weapons without fearing that it would rip apart due to the heavy load. A good quality shooting mat is fully equipped with innovative features that are shown in its overall design, making it ideal for all types of shooting demands and the design that contributes to superior performance and convenience. Pro Series Shooting Mat. This shooting mat is one of the highest rated in our list with a wide array of innovative designs including the excellent padding, secure Velcro straps, and the blocking points that offer a good space for your accessories such as your bipod. There is ample room in this shooting mat which is also fully equipped with knee and elbow pads. The shoulder and handles are likewise featured for convenience of use. Rifle Drag Bag/Shooting Mat in One. There are numerous impressive designs that are incorporated with this shooting mat including the multiple compartments and the heavy-duty hardware. It’s not just a tactical mat because it is integrated with the drag bag design to carry and stash your rifle in safety no matter how harsh the mission environment may be. Bob Allen Shooting Mat. This is one of the stylish and modern shooting mats in our selection which roll-up design for easy carry and storage. It comes with a closed cell foam construction and rubberized surface for that cutting-edge finish. There are two ways how to look into the efficiency of the shooting mat and that is in its capacity to carry and the storage efficiency. Bob Allen Shooting Mat. One of the amazing features of this item that confirms its efficient function is the roll-up design that ensures easy storage and carry-capacity. Pro Series Shooting Mat. The mat is equipped with the corner grommets made with sturdy materials in order to prevent the mat from lifting due to muzzle blast o wind. It is also made with an easy storage roll-up design for space-saving results. Rifle Drag Bag/Shooting Mat in One. The tactical mat and drag bag unit is made for the ultimate efficiency and convenience with its multiple functions and design. It includes a shoulder harness, backpack straps, and pouches for additional storage and carry. What do we recommend for the best shooting mat? Is your budget an important factor in making a buying decision? How tough is the terrain or condition you usually experience? Do you prefer a modern shooting mat with innovative features? The best shooting mat is not just a gear or accessory that could give you the cushion and storage space for your rifle and other combat accessories. It is a must-have item that would boost your overall performance and take care of your arsenal pieces to stay in top condition before, during, and after combat. Check out other essential items for your arsenal update including the scope for ruger 10/22, tactical flashlights for AR15, and slug gun scope.